Need a break from summer break? Summer vacation is supposed to be a break from paperworks and a time of relaxation but it doesn’t mean to be a time of laziness. It is a time of rest but we should take note that too much rest can also be dangerous because instead of preparing us to be more productive, it makes us too lax and complacent. As exciting as it sounds, summer vacation and long weekends can also be a breeding ground for idleness. I don’t mean that we do nothing. It’s just that we don’t do anything worthy. Like staring at the Television all day, checking updates from some youtubers or scrolling at your news feed over and over again. Then, at the end of the day, wonder how time fled so fast! making the best use of the time, because the days are evil. We should be wise where we invest our time because it is a gift we freely receive but we cannot generate. My mentor would often say that we don’t need extra time because we all work under the same 24-hour clock. What we need is wisdom in using it. “If only I have…” “If only I go to…” “If only my parents are like this and that…” “If only this country…” and the list goes on! These words paralyzes us thinking that we can olnly do something if some of these are met. But the truth is the opposite. “I will make a difference but not today, maybe someday.” We should be careful in delaying things because we don’t no when is the due date and, surely, we don’t want to come the season of regret. 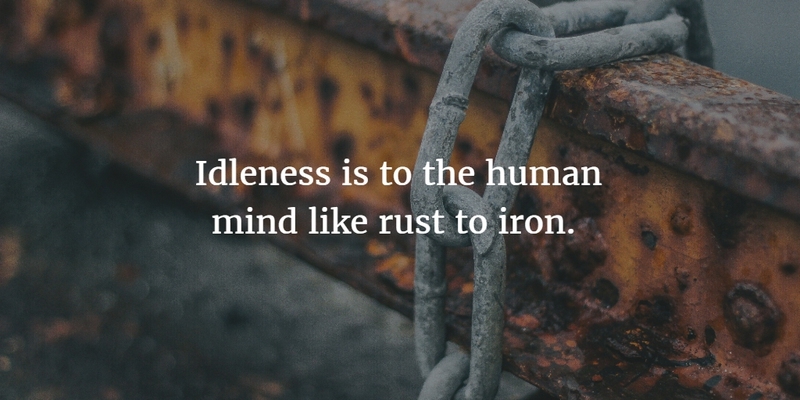 How to break from the idleness cycle? Instead of filling your daily planner with your agenda, seek for God’s agenda for you on your daily schedule because discovering and doing God’s will for you is like hitting the bulls- eye and winning the jackpot – nothing more, nothing less. While God gives specific assingments, all of these have common characteristics – it is motivated by and aimed at loving God and loving others. Doing things for others and with others reflects a life saved by grace. Like Queen Esther, we are called for such a time as this. We serve and worship a God who’s on the move. We, too, are expected to love now, to forgive now, to serve now, to be the salt and light now, and to share the love of God now. Not tomorrow, not someday but today! The best day to start changing the world is not on New Year’s day. It is today! Daughter of God. Worshiper. Conqueror. Dessertarian. Reader. Speaker. Frustrated Writer. Traveler. Pancake and Peach Mango Pie Lover. A book you can finish a day acrostic poem Action Aj Michalka Alberto Florentino Amador Daguio Angelina Jolie Break from Idleness call Challenge Chocolate Christian Movie Christian Song class suspended Collins Classics Constitution Contemporary Literature Dating Desiderata Dessert diadem diary dreams Dreamworks Animation due process Elisabeth Elliot Extravagant Love Faith Father February Poem Fiction Finals fireproof forever Francesca Battistelli Friendship God God is good golden cup Grace Unplugged Grateful Harry potter Hiccup hope horcrux Inspiration Isaiah 43 19 James Denton Jay Asher Jesus Jesus is my healer JK Rowling Johnny Depp kari jobe kirk cameron lost and found Love Came Down Love Status Max Ehrmann Midnight Missions Never had been Novel Pancake Poem Prayer Psalm 34:8 Rain Sci-fi Movie Teacher thalassophile Thank you the one The Wedding Dance What is love?